In 1980, the Dia Art Foundation, founded six years prior by Philippa de Menil, Heiner Friedrich, and Helen Winkler, published its first volume of poetry. 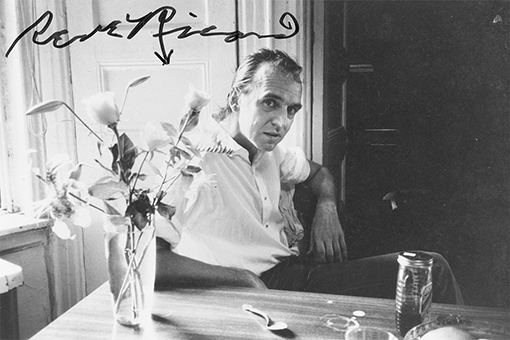 The “poetry series” saw its rise and fall with Rene Ricard’s provocative collection, Rene Ricard, 1979–1980. The book—this book—is a testament to that moment of intersection between a young arts institution and the flaming poems of a young Rene, making his way through the social, literary, and art worlds of New York. The singularity of his voice—the voice of a vigorous and vulnerable author, writing with raw energy of his lovers, enemies, and desire for revenge, of his fatigue of the rich, his sorrows, his social woes, and his absolute presence of being—resounds forcefully today still. For Rene, the poem’s material support takes the form of a book almost incidentally, spurred by that medium’s convenient dissemination and low production cost. His reclamation of the value of his work (as strategic as it may be) and his reformu-lation of his position as an artist, or a crafter of poems, constitutes a significant statement of intent. For in this letter, emerges not only a poetics but also a call for compensation for labor which he deems indissociable from the life of the artist. Negotiating the terms of an economy in which a poet could never claim, even level-headedly, the same fee or financial reward as an artist producing monumental land art, or soon-to-be blue-chip art, or have his writing in book form circulate as a high-priced luxury art commodity, Rene clearly re-articulated the locus of his work in himself, and for this, he donned the artist’s dress. Between the harsh realities of life. The other night. It serves me right. So I guess they think I don’t do anything. Which does in a sense make it worthless. lay on the floor below. In 1980, it might have been possible, in the press release for this book, to write, “Rene Ricard’s poems come from nowhere; they are neither causative nor certainly with any history.” Today, it is in part for the way they have indelibly left their mark on the history, people, and literary and art worlds of New York and beyond that Rene’s work should be re-read. They continue to compellingly approach today’s reader in their immediacy, their determination to say all without compromise or reserve, in the risks they take in exposing the vulnerable, precarious, but also licentious self. The world his poems evince and draw out generously offered itself up for translation, and in this way, gave us the oppor-tunity to linger with Rene Ricard for three years to produce his first French translation, published here in a bilingual volume. This text is featured as an introduction to the book Rene Ricard 1979-1980, published by Editions Lutanie in March 2018. Picture: Rene Ricard, July 29, 1986. Photo by Allen Ginsberg, courtesy Stanford University Libraries/Allen Ginsberg Estate.